The Qhapaq Ñan road network spans six countries and links modern-day South America to the legendary Inca Empire. Tracing the spine of the Andes, the once heavily trafficked stretch of the Qhapaq Ñan (meaning ‘the royal road’ to the Incas) between the northern Peru villages of Huamachuco and Mollepata now sits quiet, devoid of footfall save for the occasional villager or intrepid hiker. But even when there’s no-one in sight, the region hums with the echoes of a great civilisation that disappeared long ago. In the 15th Century, the Qhapaq Ñan road network comprised a staggering 30,000km of roads and trails spanning the entire Inca Empire from Argentina to Colombia, linking the fecund Amazon with the towering Andes. The Qhapaq Ñan was serviced by around 2,000 tambos, or refuges, strategically located about a day’s walk from one another. The tambos served as rest stops for the chaskis (relay runners) who carried messages throughout the empire. The system allowed the Incas to get a message from Cusco, Peru, to Quito, Ecuador, (a distance of 2,500km) in only seven days. In June 2014, the Qhapaq Ñan was designated the largest Unesco World Heritage Site on Earth, comprising 273 component sites across six different countries. Still, little is being done in the way of preservation, and much of the Qhapaq Ñan has been lost over the centuries. Erosion has always been a foe, and climate change has exacerbated its effects. Earlier this year, devastating floods caused by El Niño conditions in northern Peru washed away vast sections of the road. Avid trekker Nick Stanziano (right) hopes to change that. With the help of archaeologist Kevin Floerke and adventurer John Leivers (best known as the tough-as-nails Australian guide in the book, Turn Right at Machu Picchu), Stanziano plans to develop a trekking route along the ancient roads to educate travellers about what was once an extensive trade, communication and defence network for the Inca people. More than 18m wide at some points, the Qhapaq Ñan easily meanders along the dizzy ravines and craggy cliffs of the Andes. Some steep passes feature thousands of individual stone steps, while boggy areas are forded by spectacular causeways. Rope bridges – which could bear loads of up to 90,000kg – were rebuilt every year to ensure their strength. But in a cruel twist of fate, the brilliance of the Qhapaq Ñan played a huge role in the speed of the Incas’ demise, as it allowed the Spanish conquistadores to more easily infiltrate what would have otherwise been a terribly inaccessible region. For centuries afterwards, the Qhapaq Ñan was largely forgotten. Stanziano recently hiked more than 2,800km of the Qhapaq Ñan from Ingapirca in Ecuador to Cusco, Peru. After seeing the dilapidated state of the roads, he plans to hire locals to lead the treks and engage local communities in preservation efforts in hope that they will be incentivised to maintain the extraordinary network. For a road to survive it has to be used," Stanziano said. Inca roads can reduce the fittest hiker to tears – steep ascents and descents seem to show little regard for topography. But there was a method to the madness: walking on mountain ridges ensured travellers could easily spot danger. Over the past several decades, large tracts of the Qhapaq Ñan have been paved over or severely damaged by hooved animals such as horses. Llamas were the only pack animals used by the Incas: their soft, padded feet caused little harm to the road, and the animals proved especially nimble over the rugged terrain. Llamas can be moody – they’re liable to spit and have been known to lie down and refuse to walk. But watching a llama train navigate the slopes of the Cordillera Blanca – a stretch of the Andes named for its permanent snow caps – is to see an animal entirely suited to its environment. In some areas, the road passes long-abandoned archaeological sites – such as Pariachuco in northern Peru, pictured here – many of which have yet to be thoroughly studied. 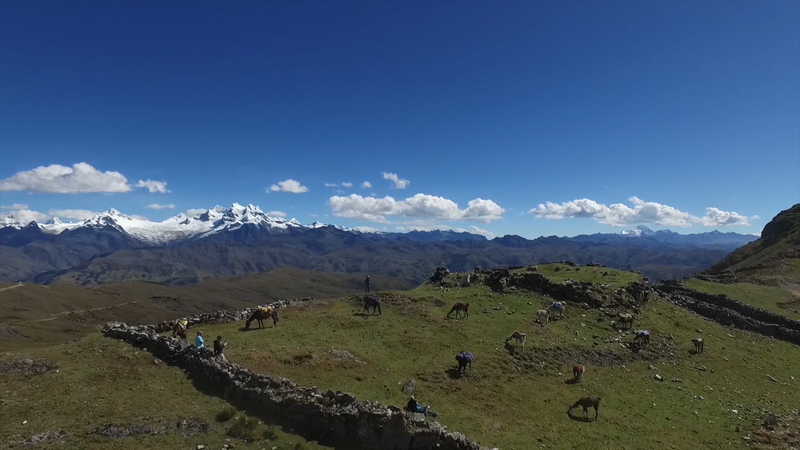 For Floerke, these sites provide a rare glimpse of a little-known side of the Inca Empire. “To see them in person and visit so many long-forgotten places stokes a feeling of wonder that you sometimes lose after years in the field. It made me feel like a kid again,” he said. Stanziano and Leivers know it will be difficult to create tourist interest around an archaeological site this large; smaller sites like Machu Picchu are logistically easier to visit. But by focusing first on select sections of the best-preserved road – like those found around Huanuco Pampa, once a thriving Inca city in north-west Peru – they hope to establish a model that will inspire other regions to preserve this unique link to the legendary empire. Walking the road allows you to really get into the minds of the Incas; to understand who they were and what made them tick," Leivers said.